Quick: You are in Adventureland, and you have an insatiable urge for something cold but sweet. But, you only have one snack credit left on your Magic Band. Do you head to Aloha Isle to treat yourself to a Dole Whip, or do you go to Sunshine Tree Terrace and grab a Citrus Swirl. Are you down to Dole Whip, or are you a member of the Cult of Citrus? Ultimately, which one is the better Disney World dessert? It’s an Adventureland throw down! The Dole Whip is one Disney World’s most iconic desserts. For many people, they cannot go to Orlando without getting a Dole Whip. And there’s a good reason for this tradition: It’s creamy, it’s sweet, and Aloha Isle offers it in a variety of flavors. Whether you want a classic Dole Whip float, or if you opt for a less standard Pineapple-Orange swirl, there should be a Dole Whip that will satisfy your craving. It’s reasons like this that so many people have loved the Dole Whip for decades. The Citrus Swirl is somewhat of a comeback story. Both it and the Orange Bird disappeared for years at Disney World. However, both Adventureland mainstays returned in 2012 to much fanfare from WDW diehards. The Citrus Swirl is a really great dessert. With frozen orange juice swirled with creamy vanilla ice cream, it’s reminiscent of a creamscicle if it was made from actual oranges. The frozen orange juice gives the Citrus Swirl a nice tart kick, as well as a half slushie-like texture. It’s a treat that has its own mascot in the Orange Bird, which is one of my favorite Disney World characters. (I have no explanation for why, but I’ve just learned to accept it and buy as much Orange Bird merch as possible). So, both desserts are delicious, citrus-based, frozen ice cream-like treats. How do you pick a winner? 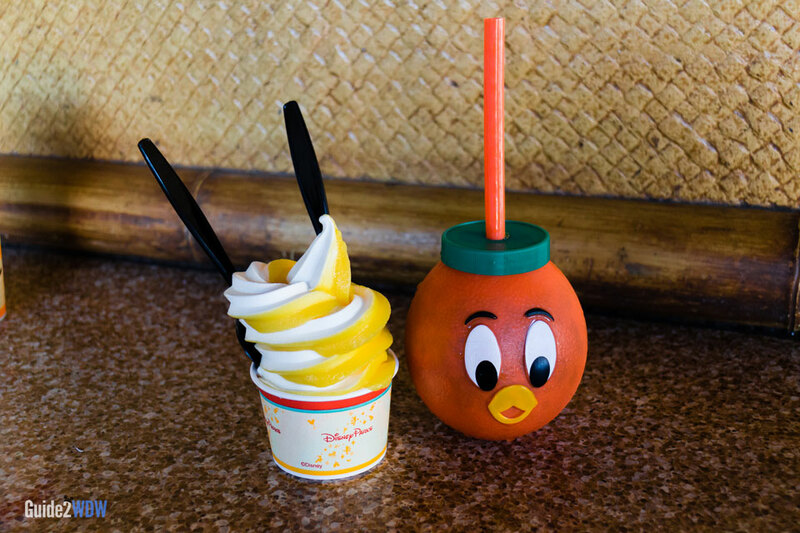 Other than the Orange Bird, the Citrus Swirl’s biggest advantage over the Dole Whip is that you can only get it at Sunshine Tree Terrace in the Magic Kingdom. To my knowledge, there’s nowhere else in the world that you can have an authentic Citrus Swirl experience. The Dole Whip is available at Magic Kingdom, Disneyland, Epcot, Animal Kingdom, the Polynesian Village Resort, Aulani, and the Dole Plantation in Hawaii. The Dole Whip has even encroached on the Citrus Swirl’s turf by being served at Sunshine Tree Terrace. 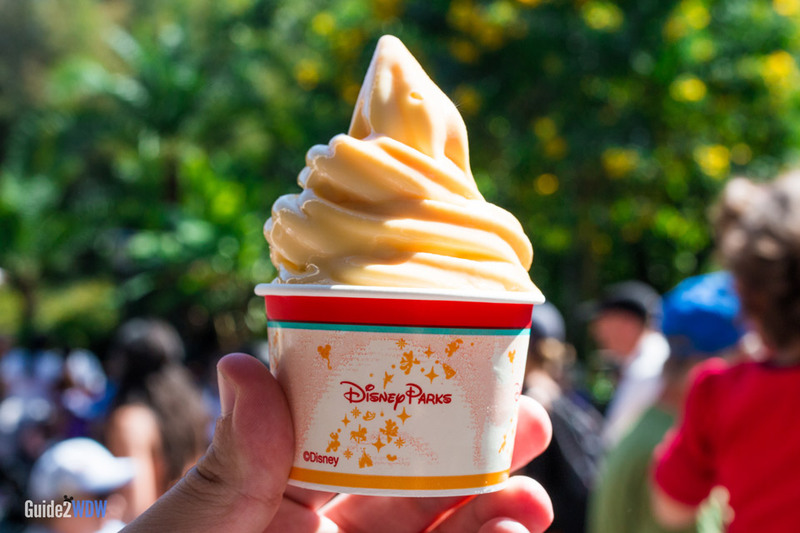 The Dole Pineapple Soft-Serve Mix is actually available for purchase online, so if you have an ice cream maker, you can treat yourself to a Dole Whip at home. I’ve also seen some ice cream and yogurt shops offering Dole pineapple soft serve. Some may argue that the wide availability of the Dole Whip is an advantage. To a certain extent, I think that it’s a great thing that it’s easier than ever to get a Dole Whip. However, it also makes it a little less special. There is something magical about having a Citrus Swirl and knowing that this is the only place I can have this experience. The Citrus Swirl definitely has a bit of a Disney hipster mystique to it. How about when it comes to flavor? After all, this is a dessert. To my palatte, they are very similar, but there are some important distinctions. The Dole Whip is creamier and sweeter. The Citrus Swirl is a bit more tart than even the pure pineapple Whip, which might turn some people off. If I could only choose one based just on flavor, I would probably pick the Dole Whip. The sweet and creamy nature just satisfy what I’m looking for out of a dessert, and I think it’s the same for most people. While contemplating this question, I took to Instagram to take a quick poll on this matter. While there were a couple of adamant “Citrus Swirl!” responses, almost everyone else chose the Dole Whip. Taking all of this into consideration, which dessert comes on top? The crazy-popular heavyweight champion Dole Whip, or the one-of-a-kind underdog Citrus Swirl? When it comes to this story, Citrus Swirl is the Rocky of Adventureland desserts. It’s got heart, it’s got fight. But much like Rocky, it does not come out on top in the first movie. In this Adventureland throw down, the Dole Whip reigns supreme. Maybe the Citrus Swirl will win in Citrus Swirl II. Stay tuned to find out. ← PSA: No flash pictures, please!